In a move that will probably cause a great deal of initial groaning and nerd rage, VMware has decided to consolidate all of the various exam certification numbers into a singular candidate ID model format. If you’re new to this concept, VMware would grant each individual who gained a certification a specific certification number, such as “VCAP5-DCA #123” if you passed the VCAP-DCA 5 exam. For those who held dear their low certification numbers among various certifications, such as the VCAP-DCA or VCP-Desktop, make sure to say a final goodbye in a manner you find appropriate. 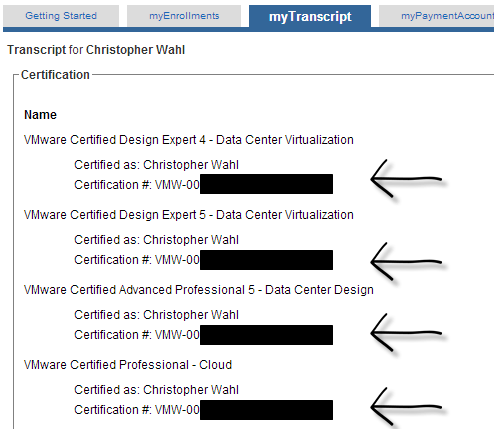 For those already in the VMware certification system, you should receive an email with your new candidate ID in the format of “VMW-123456789-12345678” where the final string of 8 numbers represents your previous VCP certification number. To streamline the certification exam registration process, and provide you a single consolidated view of your training and certification histories, we have updated our candidate tracking systems. Part of this update was the creation of a new Candidate ID for all users. 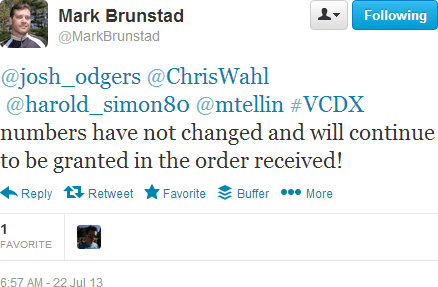 Your former Candidate ID VCP###### has been replaced by VMW-########X-0000####. This new ID will be recognized at both vmware.com/certification and pearsonvue.com/vmware. Mark goes on to say that the numers in the myLearn transcript should be reverted to the old style of VCDX numbering in the future. For now, however, they appear as the new formatted candidated ID value. In reality, VMware was a bit unique in offering a wide portfolio of certifications that had numbering values for each. Cisco, for example, grants you a single CSCO number up until you reach the Cisco Certified Internetwork Expert (CCIE) – at which point you get a special CCIE number, too. Microsoft puts most everything under their MCP umbrella, giving no special certification numbers for their MCTS, MCITP, or MCSE tracks. With VMware having a “one size fits all” candidate ID for all certifications under the VCDX, it now more or less conforms to industry numbering standards.